ClockDoc was set-up in 2010 by a few enthusiastic Dutch electric clock collectors with the purpose of bringing together historic material on electric horology. Historic material that has no longer a commercial value easily gets scrapped and may be lost. ClockDoc attempts to preserve some of it for the future. At the same time it has proven to be a great reference site for the electric clock collector community and also for educational purposes. ClockDoc is a non profit foundation, set-up and exclusively run by volunteers. ClockDoc is a site for collectors and by collectors. So everyone is welcome to contribute and share material. The material on the site was initially brought together from our own collections but since the website became more widely known many great contributions were made by other international electric clock collectors, photo and film material and also documentation. What material can I contribute to the site? In fact almost anything, provided it has to do with electric clocks and is of historical importance. The material must of course be copyright free or the copyright owners must have given permission to publish. There are really not many restrictions but we try to avoid duplication. Ten clocks of the same type are e.g. not interesting to anyone…. On the other hand similar clocks with significant constructional differences may be quite interesting to site visitors. Particularly welcome is also historic clock documentation. E.g. operation’s manuals, adjustment instructions, sales catalogs. All contributions are anonymous, unless the contributor decides differently. At present ClockDoc has some 20,000 items on record and lists some 400+ electric clock makers. The numbers are growing steadily. Do contact us if you want to share material, documentation, photos. the latter preferably in high-resolution format if available. While working on ClockDoc it is exciting to notice that so much fine material emerges from private collections. Material of which its existence had never been known before. E.g. an early Mercer marine master that was taken off a scrapped Dutch passenger vessel, just after WW II. What would one say of a most peculiar “slave clock”. 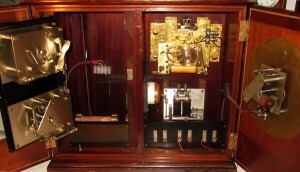 An Assmann speaking clock used in telephony: “At the third stroke it will be ….”. 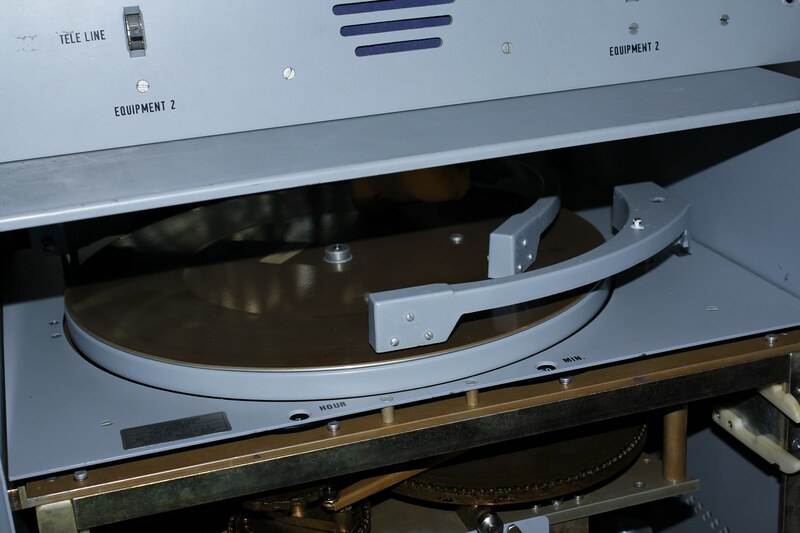 This historic piece of equipment was in use at Euro Control in Maastricht, the Netherlands into the late seventies and uses a magnetic platter as a recording medium. It is now awaiting restoration. The main section is the clock gallery. Here you will find information (photos) organized in a tree view like structure . Material is organized hierarchically in albums. E.g by maker or by type. An album may contain sub albums again. An album can contain any type of media object. Mostly photos, but may also contain video clips, etc. There is a separate documentation section. where general documentation (e.g. 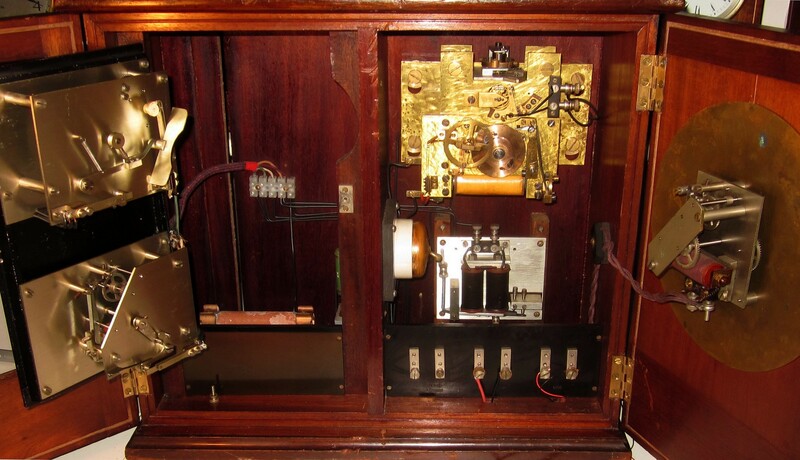 books, articles) on electric clocks as well as maker specific documentation (e.g. manuals, patent information) is grouped together . The ClockDoc advanced search engine keeps an index of all documents, general as well as maker specific. The documentation has temporarily be disabled because we are currently busy reviewing its contents. Not all documentation material is of the same quality. Often it is in the form of copies of copies. However we prefer to have poor material, rather than nothing at all. Whenever we can lay our hands on an object we try to make good quality scans, detail photos, etc. Finally, all material is freely downloadable if for non-commercial purposes. We think that sharing information is in the interest of the electric clock collectors community. Free publishing of information may also stimulate younger people to start with this wonderful hobby. Needless to say that the site is non-commercial and totally run by volunteers. We hope that you share our enthusiasm. Do make that historic material available to other collectors. If you want more information or want to contribute in any form, do not hesitate to contact us. Do also contact us if you have specific question on certain items. We may not know all the answers but fellow collectors will. Please use our contact form. Since the start-up of ClockDoc in 2012 an immense amount of material has been contributed by collectors world-wide. By now ClockDoc has over 15,000 photos and documents related to electric clocks and this number is growing steadily. The list of electric clock makers in ClockDoc counts to over 350. Initially the material came from our own collections. Later on there were large contributions from collectors world-wide. In arbitrary sequence: Michel Viredaz – the electric clock slave collection and many other photos and documentation, James Kelly – great supporter of the ClockDoc initiative and contributor of thousands of photo’s, David Read – articles on Thomas Mercer and Paul Garnier, Eddy Odell – great contributions of a.o. early clocks (like Ritchie), Frank Dunkel – clock restoration reports of various electric clocks and many photos from his own collection, Nick Maag – digitized documentation on the Swiss Magneta clocks, Agustí Tantdetemps – high quality photos of interesting electric and electronic clocks. John Hubert – contributed a huge amount of documentation material with his excellent “Notes collated on…..”, great overviews on the majority of British electric clock makers. Ted Bosschieter – contributes his unique animations of electric clocks (CD available from him). Gijs Veraart – photographed many clocks with high quality photos, also checking and re-organizing the on-line material. Peter Smith from Horologix who made his restoration stories of Bulle and Eureka clocks available to us. Rick Thomes who allowed us to recover the material of his web site on Rare American clocks. We were lucky also to get the permission from Pierhead Publications to use the material of the well-known Barrie Smith site (now off-line). Barrie inspired us to start with ClockDoc. Almost all of his text material and some of his photos were taken up on our site. Thank you all. Copyright – Most of the material on the site was contributed by the electric clock community world-wide. We seriously do our best to find the right owners and get their permission for publication but we may not always succeed. If you do find copyrighted material do let us know and we will take immediate action. We also ask you as a contributor to only send your own material or material of which you are certain that it is not copyrighted. Thank you.